Decal kit for evinrude 235 hp VRO V6 from mid 80's 1985. made from Evinrude 1985 235hp EVINRUDE 1985 E235STLCOR ENGINE COVER - EVINRUDE. 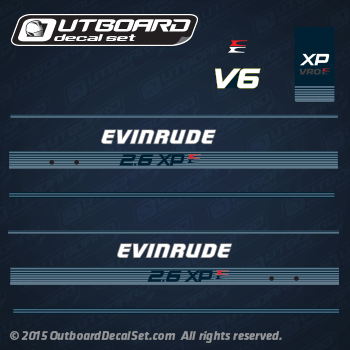 Sides Evinrude emblems has been replaced for a decal version on this decal set (Evinrude letters with darker silver outline). All decals have a metallic finish. letters on image image looks white but the color is silver.